This spring, OSLO PILOT is pleased to cooperate with Kunstnernes Hus and Vigeland Museum on a project surrounding the work of Norwegian artist Siri Aurdal (b. 1937). Encompassing a newly released publication, an exhibition at Kunstnernes Hus, and an outdoor presentation in Vigeland Park, the project reintroduces Aurdal’s groundbreaking body of work both locally and internationally. The motivation springs from fellow artist Eline Mugaas’s (b. 1969) longstanding efforts to archive and document Aurdal’s work in a major publication, building a cross-generational dialogue across artistic mediums. 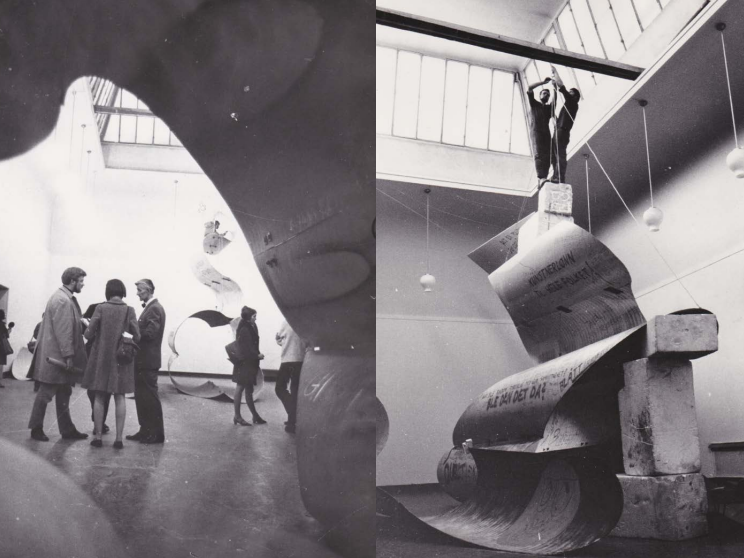 Active in the 1960s and 70s, Aurdal is an innovative figure in modern Norwegian art history because of her experimental use of materials and monumental installations in which the audience played an active and cooperative role. An integral part of the radical artist group GRAS, Aurdal developed a material approach that emphasizes art’s social and political role. Her wavy sculptures are made of prefabricated industrial materials—including fiberglass and polyester tubing—and were first exhibited at Kunstnernes Hus in 1969. Introduced towards the end of the 1960s, these same materials were developed into products for the burgeoning oil industry in Norway at the time, and continue to be used today. Aurdal’s sculptures are modular systems that elaborate an open and mutable form that can be adapted to different indoor and outdoor spaces. For this project across venues, the sculptures will be presented in a vertical format at Kunstnernes Hus, and later reworked into a three-part horizontal configuration in Vigeland Park. Titled AURDAL / MUGAAS, the exhibition at Kunstnernes Hus is on view March 4–May 8, 2016. A collaboration with OSLO PILOT, Kunstnernes Hus, and Vigeland Museum, the presentation in Vigeland Sculpture Park will open in end of June and be on view to the public until the beginning of September 2016. The publication Siri Aurdal by Eline Mugaas is published by Primary Information, and supported by OSLO PILOT, Kunstnernes Hus, Fritt Ord, and Norsk Kulturråd. The exhibition at Kunstnernes Hus is supported by Norsk Kulturråd, Bildende Kunstneres Hjelpefond, Vederlagsfondet, Bergersenstiftelsen, Inrgid Lindbäck Langaards stiftelse, Norsk fotografisk fond, and Statens utstillingsstipend. The sculptures are produced by Kunstnernes Hus and OSLO PILOT and fabricated by Fellesverkstedet, Oslo.